As we age, much of our physical makeup tends to degenerate, resulting in serious health conditions. A synovial cyst may form along the lumbar spine, resulting in painful movements as it affects nearby tissues and nerves. This fluid-filled sac may indicate the deterioration of your spine. We will uncover why these cysts develop and the various treatments available. You may also want to know how to maintain a healthy spine and strengthen muscles. A synovial cyst is a small sac filled with synovium fluid that appears on the spinal column, between the fourth (L4) and the fifth (L5) lumbar vertebrae. They result when the facet joints of the vertebrae begin to deteriorate over the years, and cause the synovium fluid to build up. This fluid collects and forms into cysts, which begin to compress on the spinal cord nerves. 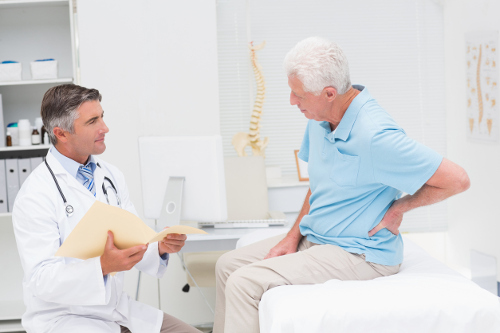 Most synovial cysts are seen in those over the age of 50 and usually occur on the lower lumbar spine. Although they are benign cysts, these sacs can still be a cause for concern, as they can lead to serious complications. One may be a condition known as spinal stenosis, where the spinal cord shrinks or narrows in size as the pressure of the cyst reduces the open spaces in the spinal column. The greater the pressure, the more intense the pain and muscle cramping will be. Synovium fluid lubricates facet joints for easy movement. Synovial cysts form when the synovium fluid begins to gather and collect into sacs due to degenerating facet joints. These joints are located in the vertebrae of the spine and are like other joints in the body. Facet joints have cartilage that allows the joint to move, and this cartilage causes friction as the joint deteriorates over time. This deterioration can force these sacs to grow and apply pressure on the spinal column and nerves. A synovial cyst may cause pain when standing from a sitting position because the nerves become irritated due to the improper draining of venous blood when standing. The complications resulting from a synovial cyst can include spinal stenosis, bowel issues, bladder problems, or cauda equina syndrome (CES). Since synovial cysts form on the spinal column, specialized radiological and imaging tests need to be carried out to confirm a diagnosis. The doctor will take note of any symptoms, as well as your medical history. Tests may include a magnetic resonance imaging (MRI) test, which will highlight a synovial cyst as a hyperintense lesion. You may also have x-rays to show the spine’s stability and joint structure. These can include flexion-extension x-rays to detect any vertebrae that may have slipped forward. If this is the case, you may require surgery to correct it, as well as to have the cyst removed. Synovial cyst treatment will depend on its size and location, as well as the accompanying symptoms. Cases of a serious nature will require surgery to remove cysts. Many physicians recommend nonsurgical treatments to treat synovial cysts. These include prescribed and over-the-counter pain relievers like injections. In some cases, a steroid is injected into the facet joint to relieve inflammation before draining the cyst. In others, an epidural steroid injection is used to target the pain, but it does not reduce or remove the synovial cyst itself. Most cases will only require lifestyle changes and pain relievers. Doctors often prescribe the “wait-and-see” treatment method when there are no serious side effects or interruptions to daily tasks. You will be instructed to limit bending motions and prolonged standing periods. Rest is also important, along with 15-minute hot and cold compress treatments. You may also be taught back strengthening exercises. Your doctor may also recommend daily walks. You can incorporate lifestyle changes to prevent health issues with your spine. These include maintaining a healthy weight, as carrying excess weight can cause compression of the vertebrae onto the facet joints. While regular exercise can help prevent weight gain, it is also important to add strength training to your routine. By improving the strength of your core muscles, you can shift the balance of your weight to the core rather than your spine. A synovial cyst can lead to serious health conditions of the spine, despite being an asymptomatically issue itself. As the cyst fills with synovium fluid and grows in size, it can cause compression on nearby nerves and vertebrae, as well as shrink the spinal column. You may experience numbness, weakness, and pain in the legs that can radiate down to your feet. A synovial cyst may be asymptomatic and eventually clear up on its own. There also may be cases where you feel numbness and pain with the possibility of nonsurgical treatment. Surgery will be considered for synovial cysts that cause compression on the spine and nerves. You can start preventing spine problems today by getting rid of excess weight and strengthening your core muscles. Holland, K., “Synovial Cyst of the Spine: Symptoms and Treatment,” Healthline, January 26, 2015; http://www.healthline.com/health/bone-health/synovial-cyst#the-basics1, last accessed June 30, 2017. “What is Synovial Cyst and How is it Treated?” ePain Assist, March 7, 2017; https://www.epainassist.com/back-pain/synovial-cyst, last accessed June 30, 2017. Hochschuler, S.H. “Synovial Cyst Symptoms and Diagnosis,” Spine-health, April 9, 2014; https://www.spine-health.com/conditions/spinal-stenosis/synovial-cyst-lower-back-symptoms-and-diagnosis, last accessed June 30, 2017.